Geophysicist, Michael Brien, is more used to analyzing the hidden depths of the land, rather than skimming across the deep blue face of the ocean. But that’s what he’ll be facing for the next 11 months, as he embarks on a circumnavigation in the Clipper Round the World Yacht Race. Michael, part of the Geophysics team at Met for the last 11 years, decided it was time for a new challenge, and a break from all that mud and ground! 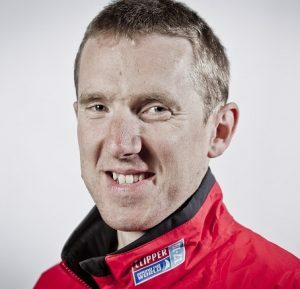 “I started sailing as a 14-year-old on the Menai Straits; but after university I stopped, for various reasons, including other hobbies and living about as far as it is possible to live from the sea. In 2013, I joined the Eda Frandsen on a 9 day trip round the Hebrides, and wondered why I ever stopped – because it was awesome! The Tall Ships Regatta (from Falmouth to Greenwich) followed in 2014, and then the Fastnet Race in 2015. At that point, I thought it would be a great idea to sign up for the Clipper Round the World Race, it was a safe 2 years and 8 months away, I’d be an accomplished Yachtsman by then, surely?! Now it’s here, I’m not sure if I’m more nervous or excited. Setting off from Liverpool docks on Sunday 20th August, the Clipper Race comprises of 8 legs, each with their own individual race points up for grabs. Ranging from 6,326km to 11,450km, each leg presents its own unique challenges. Crew members will either sail on a single or number of individual legs, or, like Michael, be a circumnavigator and take part in the whole trip. Although Michael will be very much missed from the team at Met, we wish him the best of luck in the race, and his future sailing adventures, and we’ll be keeping a close eye on his progress once the race sets sail.